Here we go again, folks. I for one found the rather vague term “homeless individuals” intriguing. I’m guessing these chaps learned from 400 McGuinness 1.0 that the phrase “homeless single men” is off-putting to some people hereabouts. 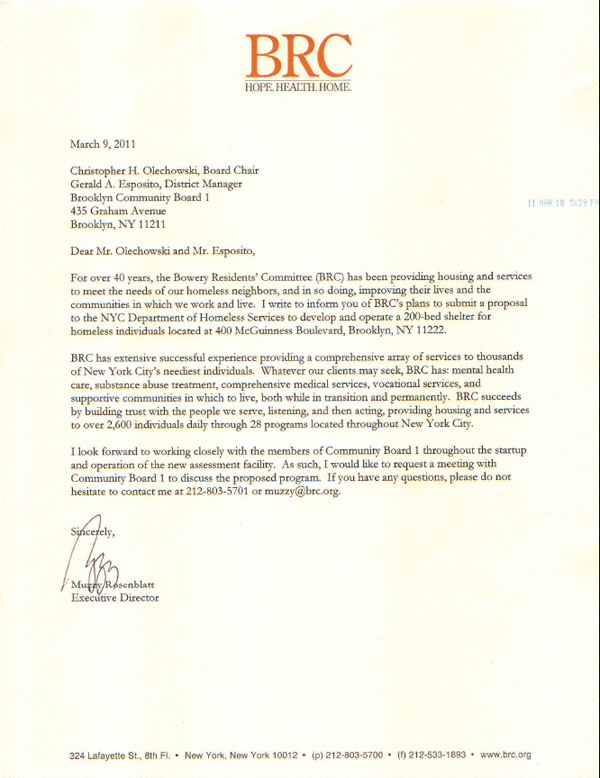 On the other hand, at least they have shown some willingness to work with our local Community Board. Speaking for myself, I want to see for myself exactly what this organization is proposing. Especially in light of the fact a representative of the Department of Homeless services stated on February 8, 2011 (the latest Town Hall Meeting) that no plans for a homeless shelter/intake center in Greenpoint were in the works—- yet this property was sold shortly thereafter and yet another RFP has been filed for basically the same thing. What gives? By all appearances it would seem the Department of Homeless Services is intent on putting an intake center there. Most importantly of all: what’s in it for Greenpoint and our homeless population?